She's regarded as one of the most creative stars in pop and reinvents her image every day. And for her current trip to Paris, Lady Gaga opted for black braids and a daring hippie inspired look as she left the Zénith concert venue in the French capital on Saturday. The Poker Face singer, who is in the city as part of her artRave: The ARTPOP Ball world tour, took the time to greet the excited fans gathered outside before heading home. 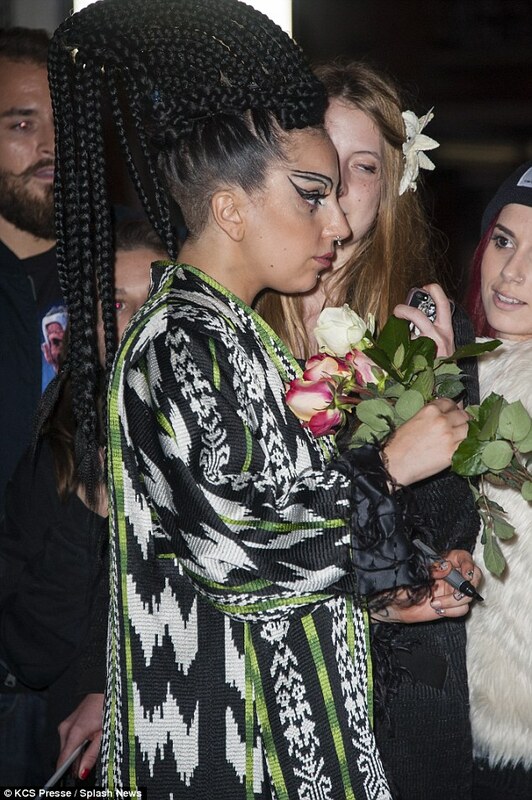 Gaga was showered with attention and gifts as she signed autographs and posed for numerous selfies with her French fans, one of whom presented her with a massive bouquet of roses. The 28-year-old star was wearing a thigh-skimming rock T-shirt with an Aztec print green and black jacket thrown over the top. The bold outfit was set off with bare legs and a surprisingly simple pair of patent heels. She had gone all out with her make-up, drawing intricate black lines above her eyebrows and emphasising her eyes with a flack of winged eyeliner. 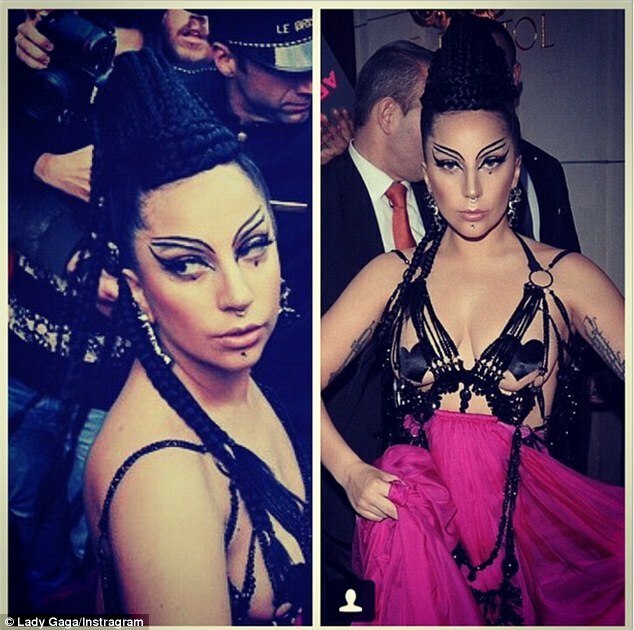 The superstar accentuated her futuristic look, which she has dubbed 'Paris Gypsy', with several facial piercings. While Gaga - real name, Stefani Germanotta - has been enjoying her time in France, she is missing her loved ones dearly. Referring to her boyfriend Taylor Kinney and her frequent musical collaborator Tony Bennett, she tweeted: 'If I’ve got anything to say about it tonight, Paris Is Burning #artRAVEParis style. 'Sue me I love Paris. Missing my two T’s. Taylor and Tony', she added. The star amused her loyal Little Monsters on Friday when she stepped out after her concert wearing a bed sheet with cut-out eye holes, scaring them with ghostly noises.